To measure art on stretcher bars like oil paintings. All frames will be cut 1/16" to 1/8" over the size ordered so your art will fit properly, unless otherwise specified. Frame Height. 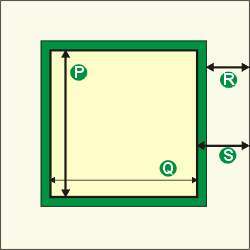 These are the measurements given most commonly when ordering a picture frame. ( At The Gallery all sizes are quoted giving these size references ). Often referred to as the "glass size" or "frame size" it is the size of the piece of glass required that will not fall through the central opening in the frame. 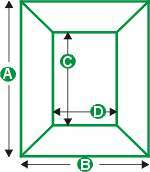 (outside measurement) Measuring a frame in this way is normally reserved for when the need is to fill a given area. It is NOT a measurement used in the standard production of picture frames, although when specified calculations can be made to accommodate specific needs. You will see these sizes quoted on mirrors and pictures to give an idea of overall size for the framed item you may wish to purchase. of the chosen design. As some matting combinations can often be more than 1/2" in depth. Example, Plain glass 1/8", double mount 3/16, artwork on foam core 1/4"
Moulding Height Aluminum mouldings are measured slightly differently than wood, first they have a set rabbet that cannot be extended and the width visible is nearly always smaller than the actual width of the design. Care should be taken when measuring an existing frame as the frame size is measured from the inner wall of the back edge. When measuring frame sizes, remember to measure from inside the rabbet on wooden frames and from the internal back edge on aluminum frames. When measuring artwork and deciding on mats, remember to allow about 1/4" over lap so that the artwork won't fall through the opening cut in the mat. Mat measurements could be a subject all of it's own, but shown here is a simple double mount with even borders. When deciding of the opening for your artwork remember to allow for a small overlap approximately 1/4" all around the image, so that your artwork won't fall through the opening when on display. Smaller tolerance can be worked with, but this amount works well on most occasions.